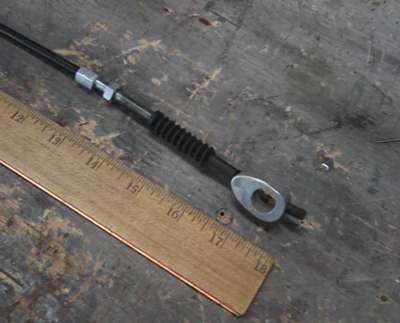 foot pedal which pulls a rod, which in turn pulls a lever at the rear hub, which in turn pushes the brake shoes against the inside of the drum. It works well, but the cast steel pedal weighs several pounds. With the foot pegs relocated it would be difficult to adapt the existing assembly. I saw photos online of a cable hooked between a stock CB360 foot pedal and the drum lever. It looked pretty cool but I decided I could do better. I sketched out a lot of designs, then went into AutoCAD and did some detailed drawings. The rearsets I used came from a CB600 Hurricane. 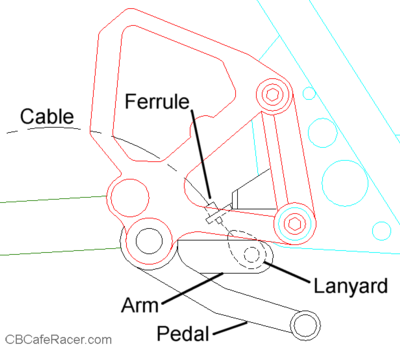 The pedal originally connected to a tiny master cylinder for a hydraulic system. I cut off the master cylinder tabs and welded an arm to the pedal, which in turn held the lanyard at the end of a cable. Because this was a trial and effort design, the first effort was a failure. The drawing at right is the second effort. Here's how it turned out. Most of it is hidden behind the rearsets. It weighs a lot less than the stock assembly, but as someone pointed out, if it didn't work I could save even more weight by taking out the shoes themselves. This version works pretty well but I might try one more time. Maybe not. To make the cable, I found parts online but wanted to go custom and made a pair of aluminum clevises at both ends. I used a threaded adjuster and found some rubber bellows (from an Italian scooter) to cover the exposed cable, The clevis looks pretty simple but the damn things took hours to make. The cable is held at the clevis with epoxy and a hidden set-screw. I made a crude version to test how strong it would be. I clamped the cable in a vise with about a foot of slack. A friend and I yanked/slammed the end as hard as we could and it took several tries before the clevis came loose. I think it'll do just fine in real life. 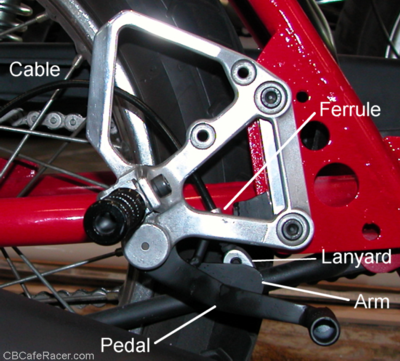 The front brake of a motorcycle does about 80% of the work but the rear is important too. 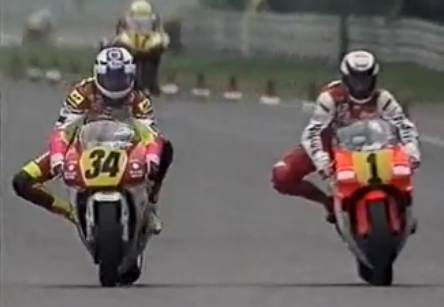 To see how important, click here to see GP500 rider Kevin Schwantz (#34) out-brake the current champ Wayne Rainey on the final lap of a race in '91 and take the checkered flag. The front brake is at the limits and the rear brake is fully locked, with the rear tire leaving a black dotted line on the pavement.